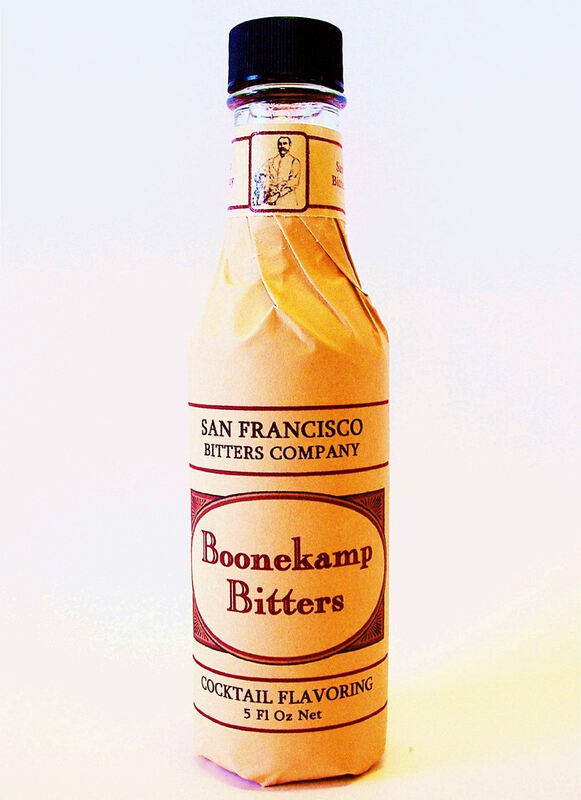 Actually, Boonekamp bitters have been available in the U.S.A. for as long as I have been paying attention – and undoubtedly a lot longer. The above passage is from Kuemmerling’s current press kit. All of the above are currently-available Boonekamp bitters. Boonekamp bitters from their real, living tradition are most commonly sold in single-serving bottles of 20 ml. (2/3 fl-oz.) each. They are digestive in that dose. They are not meant to be dashed out in small amounts like in the case of Angostura aromatic bitters (San Diego/Francisco Bitters Company got that wrong, too). To make a Boonekamp Cocktail the way that American bar-tenders sometimes did before prohibition, chill a cocktail goblet and prepare a strip of lemon zest. Into a glass mixing tumbler pour 1 small bottle (1/3 jigger, 20 ml., or 2/3 fl-oz.) of any good brand of Boonekamp bitters, add 2/3 of a jigger (40 ml., or 1-1/3 fl-oz.) of rye whiskey and a teaspoon of fine sugar (or 1/4 fl-oz. one-to-one simple syrup) and method ice. Some people might like more sugar or syrup. Stir this until completely cold and strain the drink into the chilled cocktail goblet. Garnish by twisting the lemon zest over the drink and dropping it in. Serve the drink. But back to the bitters. All of the above brands are more like each other than the San Diego Francisco Bitters Company so-called Boonekamp bitters is to any of them. I consider the San Francisco/Diego product an outlier from the tradition. I would not be surprised if its formula came from some druggist’s or chemist’s old book that included recipes meant to approximate famous products. If so, the book in question has led someone astray. That would suggest that they never themselves sampled mainstream Boonekamp bitters. 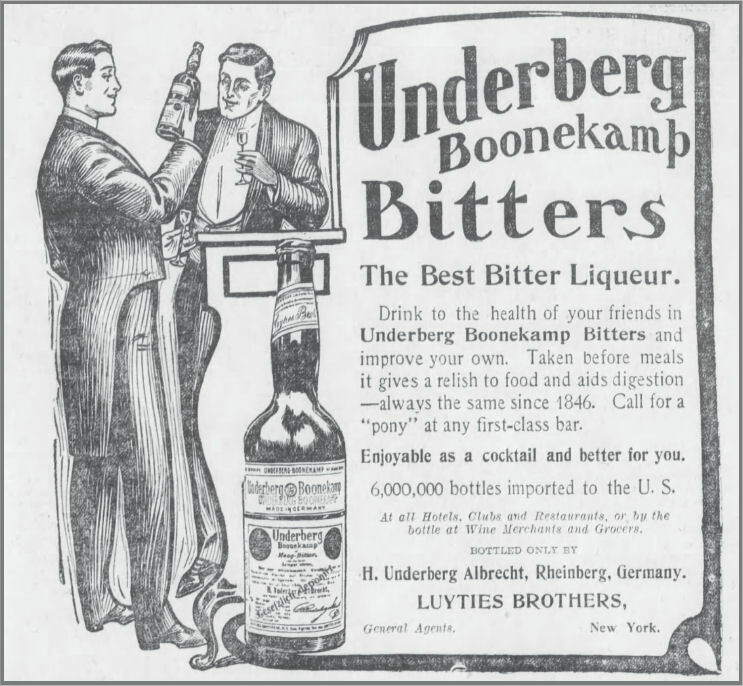 If you want Boonekamp bitters that are most reliably like those indicated occasionally in American drinks from a long time ago, get Underberg or Kuemmerling. They are both Boonekamp bitters that have been made the same way throughout the past hundred years. 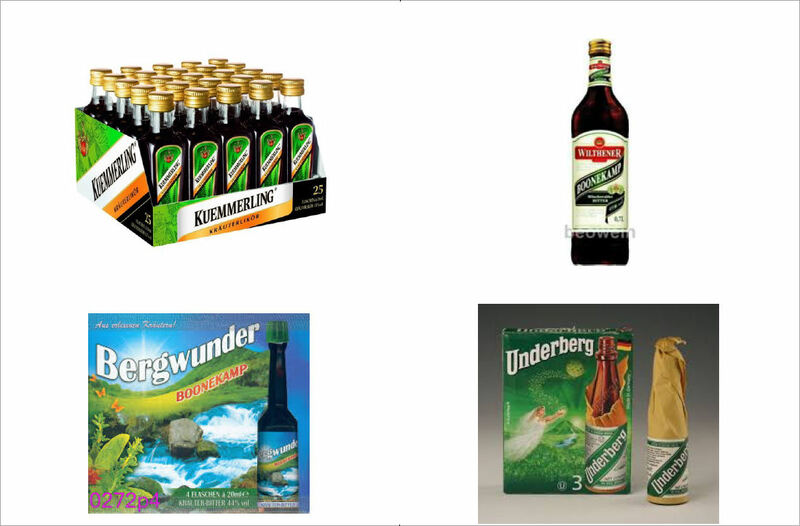 Underberg is available at Bevmo, and both it and Kuemmerling are available at Alpine Village in Carson, California. Today’s drink of the day should be of special interest to the bar-tenders of the Edison. One of my students that fell in love with this drink in the Standard Drinks Course (everyone does) related to me that he had trouble getting one when he ordered it. I started to tell him that it’s not fair to bother any typical bar-tender of today with such a request, but caught myself. When I found out that it happened at the Edison, I told him that they deserved it. He told me that the first bartender gave him a Whiskey Basil Julep, which he appropriately returned. Giving whiskey when gin was requested is not correct. Then, a second Edison bartender served my student a Gin Basil Collins (or Gin Basil Mojito, if you prefer). In came the gin, but out went the julep! I know — modern bartenders often ignore the palate and group drinks together by the tasks they perform in making them. Hence the simplistic view that the Mojito is some sort of julep. Modern bartenders also tend to add lemon or lime juice wherever possible. This sin of making every other type of drink into a punch is often done by wet-behind-the-ears bar-tenders who are still excited about using fresh juice. That is so 2007 — and it would’ve never been exciting at all if the industry hadn’t so shamefully embraced the fake stuff for so long. Perhaps the Edison (and other places pretending to practice traditional, American mixology) will see these recipes and learn how to serve this great drink without ruining by applying their modern assumptions. Sure, the drink itself did not exist long ago – but the clear understanding of the words ‘gin’ and ‘julep’ did. 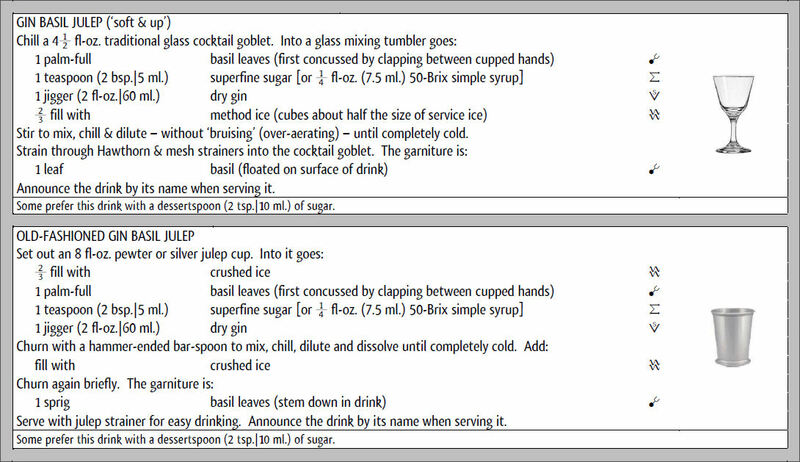 It was fairly common to find juleps based on many different spirits and served ‘up’ in goblets without ice before 1900. The only new thing here might be the basil. Happy Repeal Day, everyone — I suppose. It’s nice to be trusted to make one’s own decisions about at least one or two drugs. It must be acknowledged that the repeal of prohibition was the final nail in the coffin of pre-prohibitioin mixology. No bartenders had been trained in the old, apprenticeship-style for the better part of 15 years when prohibition was repealed. Countless restaurants, hotels and saloons wanted bartenders immediately to capitalize on the spectre of alcohol-fueled profit. Tens of thousands of unexperienced, tradition-lacking bartenders (maybe more than 100,000) being hired from one day to the next in December of 1933 was the moment that the old American mixology died. It was replaced that day with the call-them-all-cocktails-and-list-them-alphabetically phenomenon to be memorized by amateurs, many of whom undoubtedly thought they were only tending bar until the better thing they were hoping for came to fruition. Welcome to modern American bar-tending. I don’t celebrate this day, really. The day that the plug is finally pulled on a brain-dead loved-one, allowing life to get back to ‘normal’ for everyone else is not really a time to celebrate.